After visiting 52N 9E,I continued north-eastward towards Hamburg, and made a sobering visit to the site of the WWII Bergen-Belsen concentration camp, where more than 50,000 people died. Not wanting to rush my visit to such a historically significant site, I took my time before continuing on to this confluence point, not far away. I got to the point just after sunset, but fortunately was able to take reasonable photos. 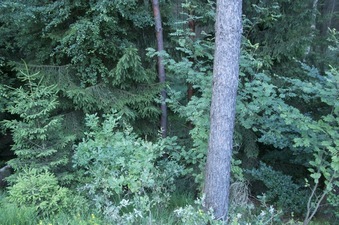 The confluence point lies just 14 meters (+/- 3m GPS error) off the edge of a paved road - down a steep, forested bank. Because of the steep terrain, plus the fact that it was after sunset, I didn't try scrambling down the bank to try to get 'all zeros', figuring that this would likely be futile.